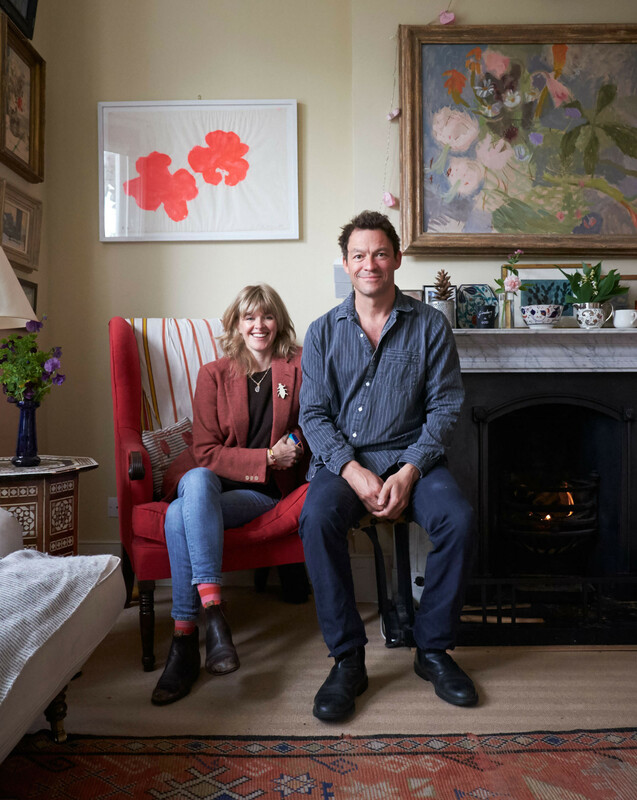 Catherine FitzGerald and Dominic West in their renovated 19th-century residence in west London. 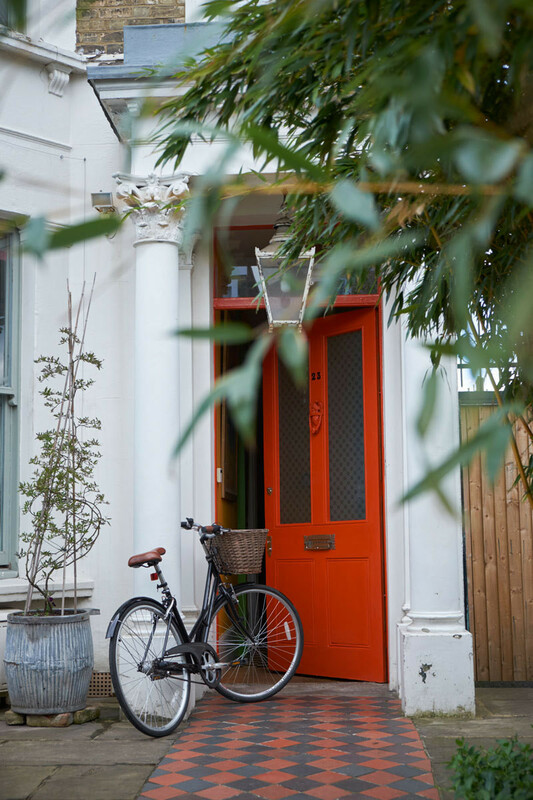 Outside a three-story residence in Shepherd’s Bush, London, the minivan and the fleet of kids’ bicycles are immediate signs that a visitor has arrived at the right address. But the 19th-century facade, punctuated by a glossy red door and a hanging lantern, only hints at the more unexpected world that lies behind an almost ordinary exterior. A tomato-red door announces the bold color choices within. 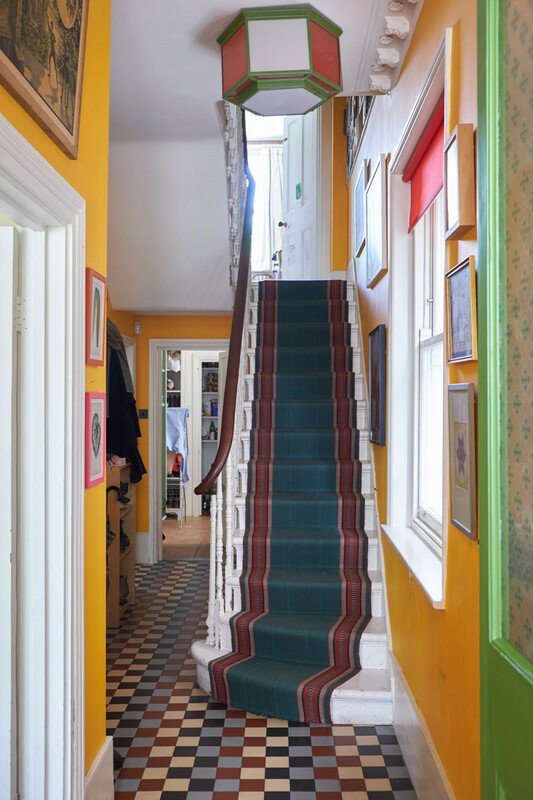 The citrus-hued entrance hall is a nod to FitzGerald's Glin Castle. Stepping through a citrus-hued hallway into a light-filled living room, the first impression the home conveys is a sense of openness, space, and color. 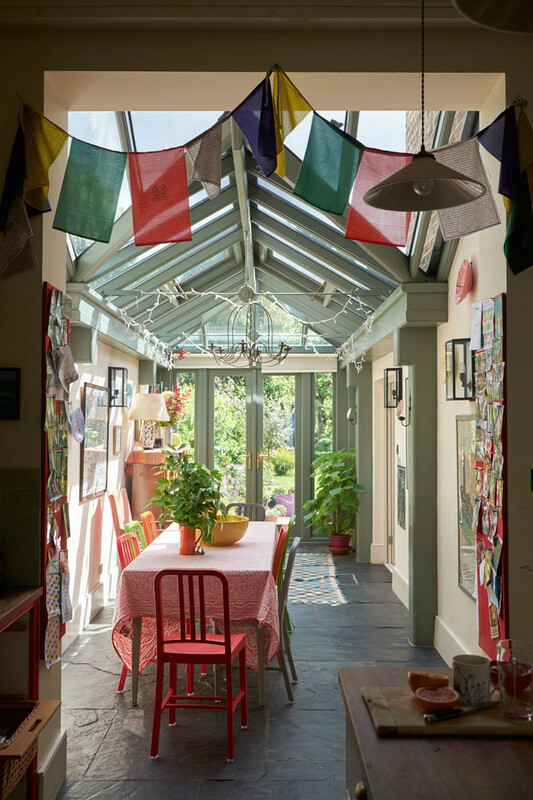 One can see all the way through the ground floor to a glass atrium that in turn leads into a blooming garden. It is a transportive experience—much like suddenly entering a country retreat from the gray city sidewalks outside. 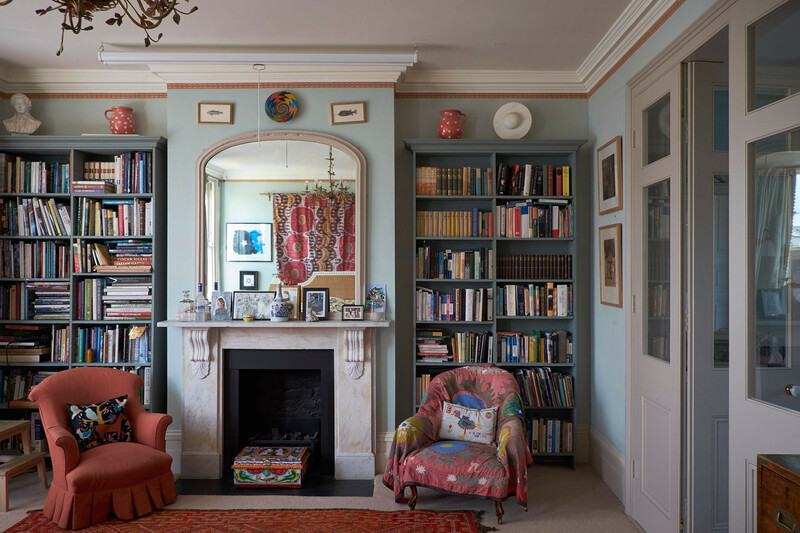 Noted British antiques dealers Christopher Gibbs and Robert Kime both had a profound influence on FitzGerald's decorating style. 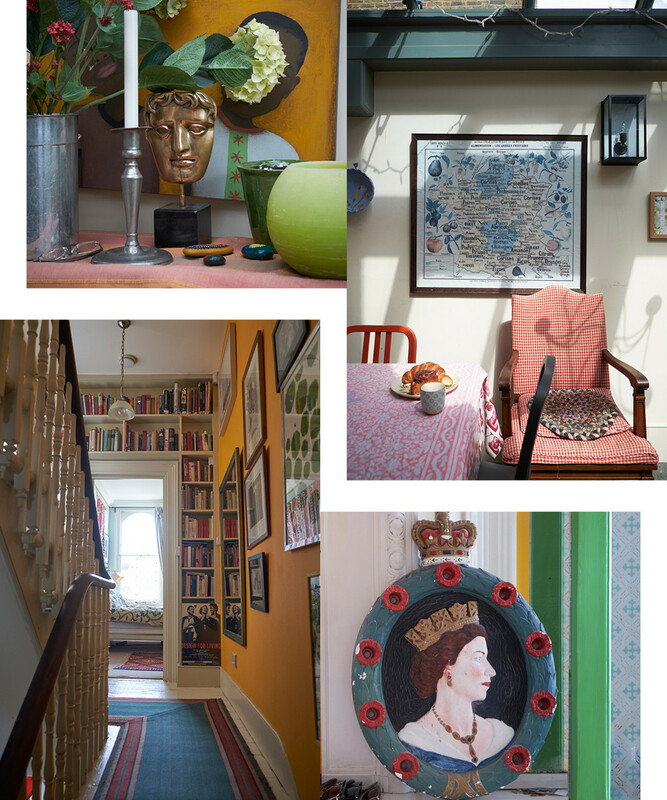 An eclectic array of textiles, artworks, and furnishings fill the main living spaces on the ground floor. As FitzGerald prepares a simple yet delicious lunch—roast chicken, a salad, and roasted red peppers with goat cheese—and discusses the day’s agenda with West, the couple’s youngest daughter, 18-month-old Cristabel, scampers between their legs. With three other children currently in London (West’s oldest daughter is away at boarding school), the daily pickup-and-afterschool routine calls for military precision. West may have become a showbiz commodity thanks to the 2002–2008 HBO series The Wire, but at home he is a hands-on family man. Prayer flags and pin boards mark the entrance to the atrium. An antique piano stands next to the dining table in the atrium. 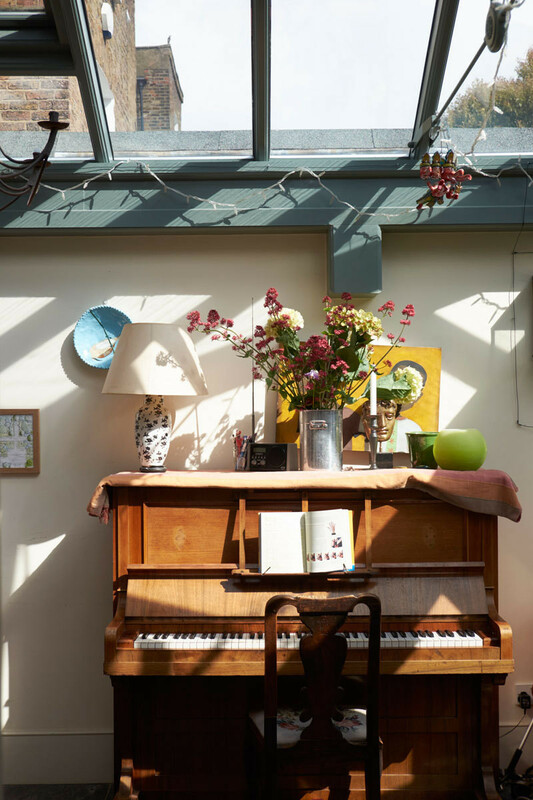 Books, blooms, and quirky memorabilia are peppered through the interiors. 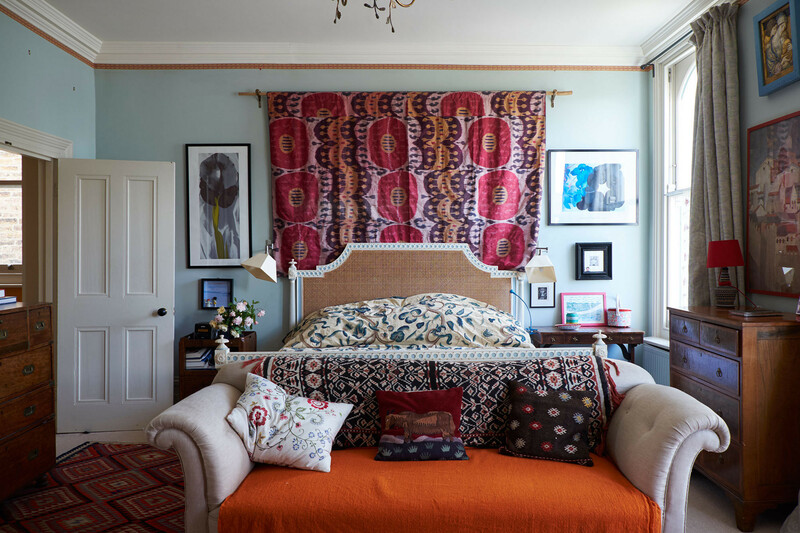 Tapestries and rugs create a worldly, comfort-driven environment in the couple's bedroom. The environment FitzGerald and West have created is a multilayered history of their time together, as well as their lives before they met. 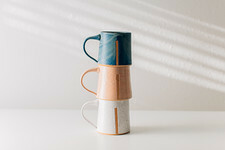 The couple married in 2010 but first dated in the early 1990s, when they were undergraduates at Trinity University in Dublin. 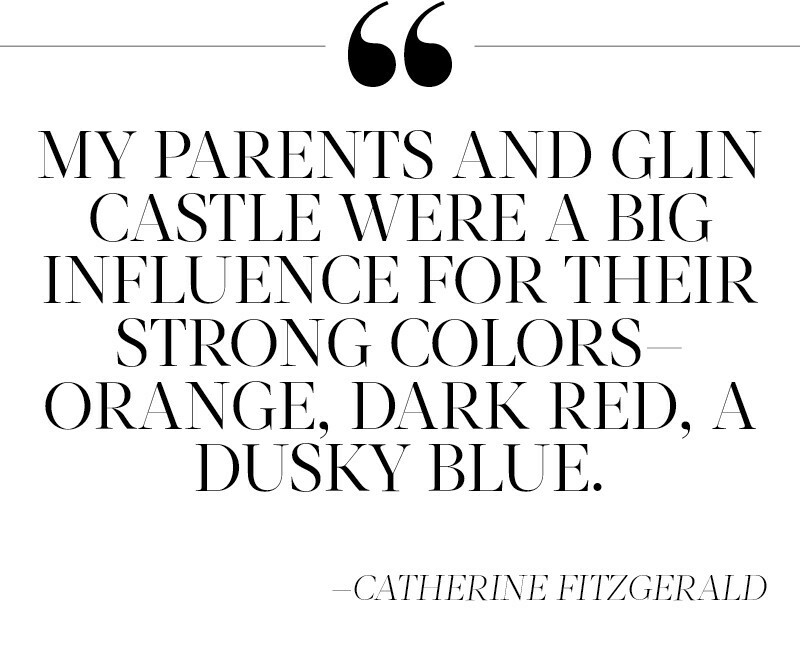 Framed posters of FitzGerald’s childhood home, Glin Castle—her father was the 29th Knight of Glin—sit atop an antique piano next to mounted bird plates found during their time in South Africa. 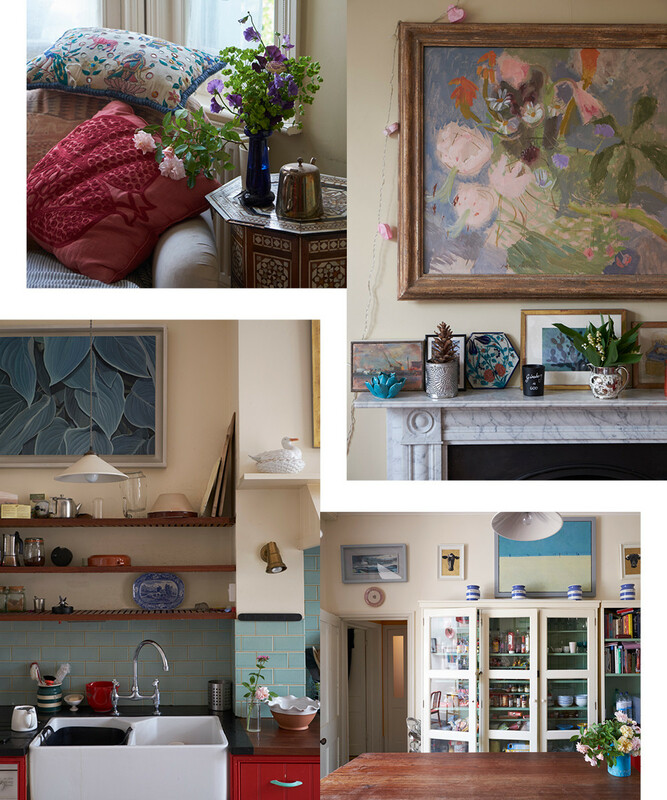 Photos of the family are pinned on felt boards near paintings collected from various fairs and galleries (an evocative blue-and-white 1970s canvas by David Scott is a favorite in the kitchen). The Tangiers carpets on the living room floor were wedding presents from Gibbs; Moroccan textiles cover the pillows on the cream-colored sofas; the wall hanging in the master bedroom was found at Istanbul’s Grand Bazaar. 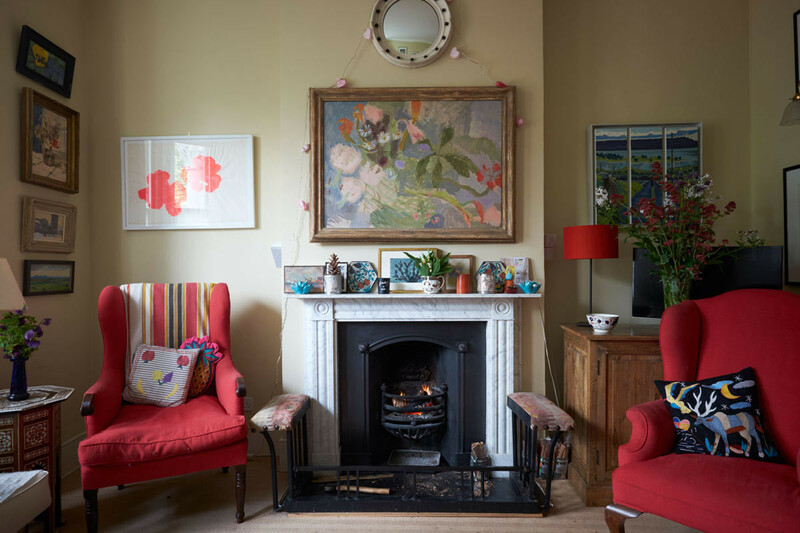 Additional artworks throughout the house include a bright Sam McKeown floral print that was a birthday present from West to FitzGerald. Pops of color, including a generous dose of red, add to the cheery effect. 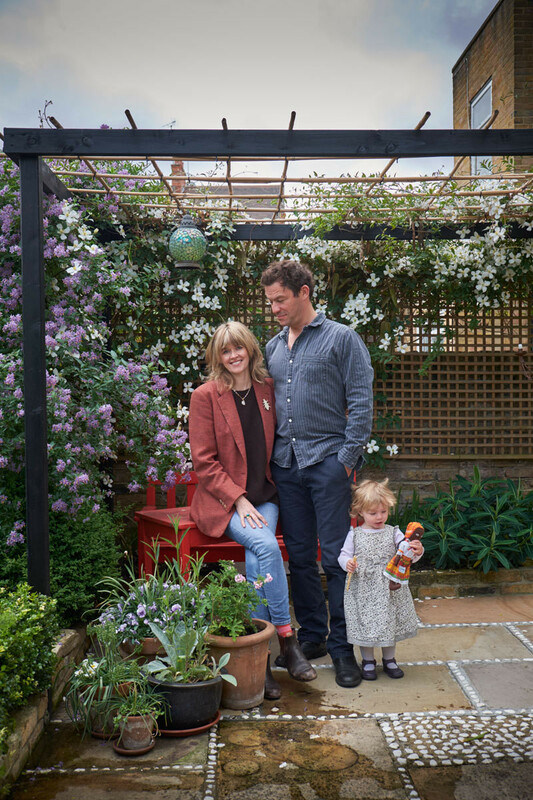 Homeowner Catherine FitzGerald shares five things she and husband Dominic West learned from decorating without a designer. 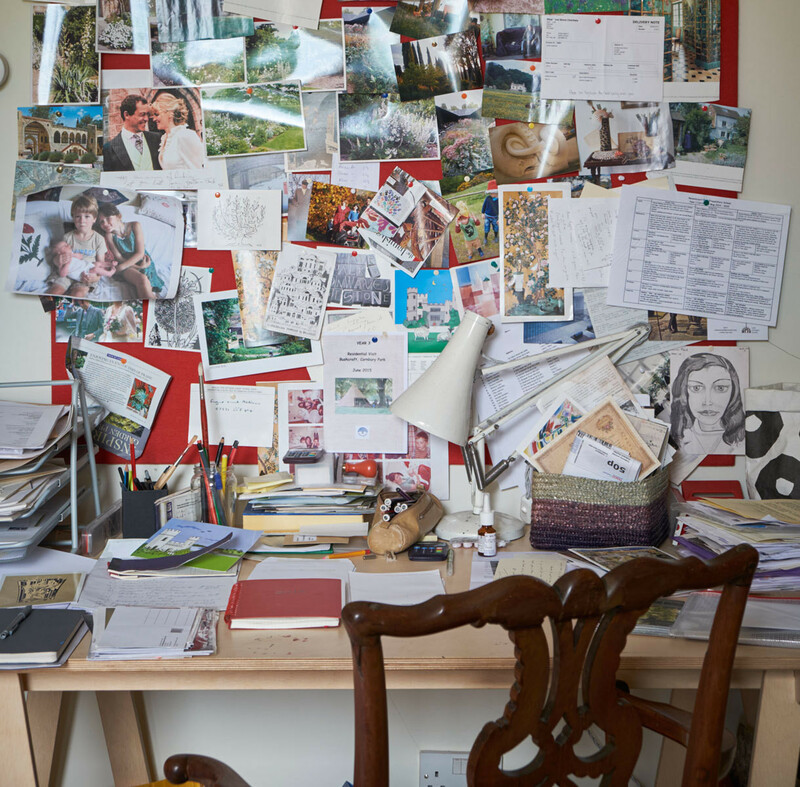 The pin board above FitzGerald's desk displays a wealth of memorabilia. The freestanding tub in the master bathroom looks out over the backyard foliage. The decision to put the master bedroom and bathroom on the second floor makes perfect sense: flooded with natural light, the space is equally suited for an impromptu slumber party with four rambunctious kids or a meditative soak in the freestanding tub. 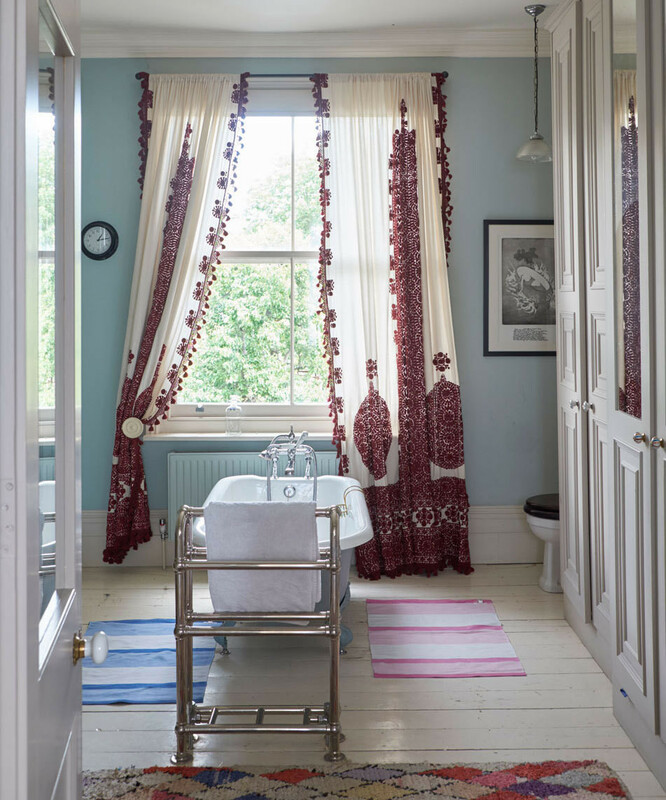 “Lying in the bath looking out onto the pear trees is my idea of heaven,” says FitzGerald. Bookshelves on either side of the fireplace in the master bedroom help convey the home's welcoming, lived-in mood. The couple under their pergola with their youngest, Christabel. 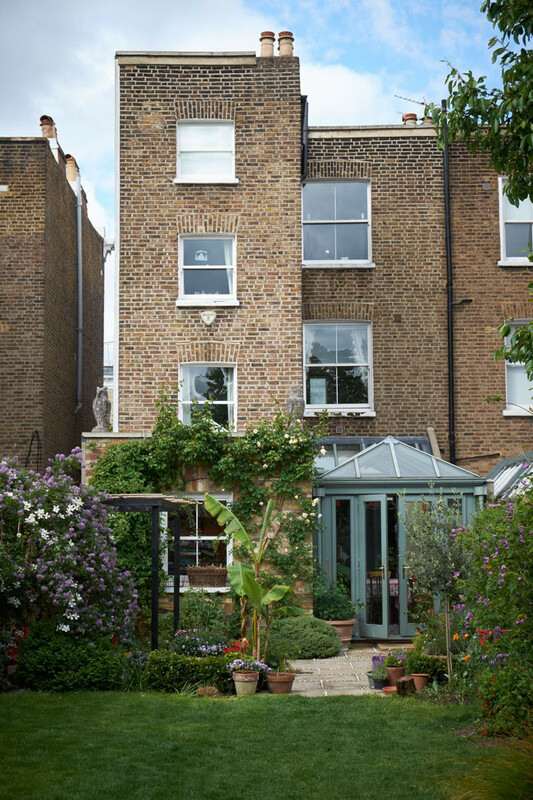 Flowering shrubs add lushness to the rear facade. 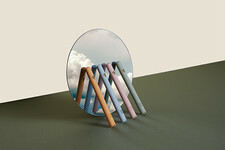 Children, chaos, charming tableaus, free-flowing spaces, and a backyard oasis all play a part in the family’s favorite gathering: a Sunday lunch with friends. As FitzGerald describes it, the weekly tradition is “a riotous environment. We feed the children first, and then as they play outside, we have a long meal under the pergola with lots of red wine. Then we read the paper or go to the park for some football.” Rambling, a little bit raucous, and most certainly fun: wouldn’t you love to be their neighbors? 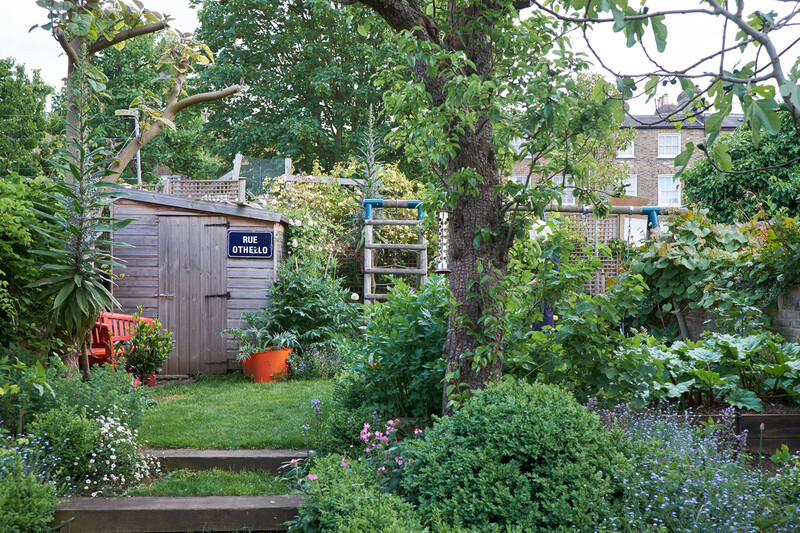 Landscape designer Catherine FitzGerald reveals the secret to her bucolic backyard.